Therasage Jade Heat Masaage Beds with Far Infrared Heat Relief Pain! Now with portable 12 V car / home adapter Jade Heat pad which plugs directly into the bed, standard 120v outlet, or in the car! 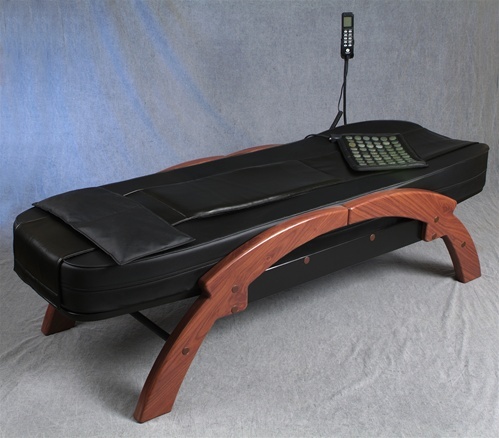 The Therasage Rx 8000S massage bed is designed to target your body's vital pressure points along the spine with a precise, relaxing massage to provide you with the combined therapeutic benefits of massage, chiropractic, acupressure and Far-Infrared Heat. Therasage offers the most comprehensive and therapeutic bed in the market. Therasage now offers the small healing pad and an upgrade to the roller mechanism with the 8000S. The pad is flexible and allows it to be contoured to body parts such as your legs, shoulder or knee or can be placed over the stomach / abdominal area. The healing pad can be detached from the bed and used as a stand alone item plugged into a regular 110v outlet or you can use the 12v adapter while driving so you’re never away from the benefits of Far Infrared Heat. For years, therapists and physicians have recommended the combination of heat and massage to ease chronic back pain, speed recovery from injuries, improve rest, concentration, and promote a general sense of well-being. The new Rx 8000 massage bed uses patented far-infrared heat strips that line the inside of the bed. The far infrared heat emitted from these strips will penetrate up to 3” into your muscles creating uniform warmth that can be felt for up to one hour after use. The bed uses customized jade rollers to deliver a thorough head-to-toe massage. The far infrared heat also gets absorbed into the jade rollers delivering a penetrating, contact-heat to the parts of your body being massaged. You can choose one of the three massage programs of relaxation, rejuvenation or shiatsu and allow the 14 jade rollers to traverse over the 60” track providing you with a full body treatment. If you feel as if the massage is too vigorous, place a softening pad on top of the bed and enjoy a less intense massage session. Far-infrared heat is a safe light energy that cannot be seen by the human eye and simulates the heat given off by the sun. This heat is absorbed by a process called conversion which sends the heat directly into your muscles without having to heat the air between your skin and the heat source. The therapeutic properties of far-infrared heat have been studied in Korea for over twenty-five years and its use is now becoming very popular in North America. The Heated Shiatsu Massage Bed by Therasage uses far-infrared heat to deeply penetrate your body (up to three inches) and stimulate your blood cells to increase circulation and reduce pain. Once you lay down on the Heated Shiatsu Massage Bed and choose your massage program you will begin to feel heat travel throughout your entire body while the jade rollers begin to kneed out all of your built up tension and pain. As you enjoy the feeling of warmth, comfort and tranquility, allow yourself to release all of your stress and anxiety. Each breath you take carries oxygen throughout your blood stream and into every cell of your body. This same oxygen you breathe each day combined with the heat and massage is now helping to relax, soothe and energize you. Continue to breathe normally as you experience total relaxation followed by a sense of rejuvenation. For years, therapists and physicians have recommended the combination of heat and massage to ease chronic back pain, speed recovery from injuries, improve rest, concentration, and promote a general sense of well-being. The Heated Shiatsu Massage Bed by Therasage uses far-infrared heat to deeply penetrate your body (up to three inches) and stimulate your blood cells to increase circulation and reduce pain. Once you lay down on the Heated Shiatsu Massage Bed and choose your massage program you will begin to feel heat travel throughout your entire body while the jade rollers begin to kneed out all of your built up tension and pain. As you enjoy the feeling of warmth, comfort and tranquility, allow yourself to release all of your stress and anxiety. Each breath you take carries oxygen throughout your blood stream and into every cell of your body. This same oxygen you breathe each day combined with the heat and massage is now helping to relax, soothe and energize you. Continue to breathe normally as you experience total relaxation followed by a sense of rejuvenation. Far Infrared Heat is one of the safest, most beneficial forms of natural heat. Many neonatal care units use Far Infrared Heat to keep babies warm. Therasage incorporates far infrared heat in it's products for pain relief and to promote wellness. See a picture of the Jade Rollers and FIR strips here. • The warranty does not cover damage caused by misuse or abuse, accident, or any unauthorized alteration of the product. • The decision to repair a product is made exclusively by Therasage Corporation after receipt of the defective product. All warranty claims must be accompanied by a copy of the original sales receipt. • This warranty is the complete and exclusive agreement between you and Therasage Corporation. It supersedes all other written or oral communications related to this product. Far-infrared waves are a safe form of light energy that is thermal. In other words, we experience infrared waves every day in the form of heat like sunlight, a fire or a warm sidewalk. Far-infrared waves heat objects by direct light conversion – a process that directly warms the object, not the surrounding air. It’s the heat you feel penetrate your skin when you stand in the sun - and miss when you walk into the shade. Far-infrared heat (FIR) is also referred to as radiant heat, infrared heat or infrared energy. Far-infrared heat has been widely used in the healthcare industry; in fact, many neonatal care units are often equipped with infrared heating systems to keep babies warm. Far Infrared Heat is the invisible part of the Sun’s spectrum. It has nothing to do with the ultraviolet light which can damage your skin. FIR waves are capable of penetrating deep into the human body, where they gently elevate the body's surface temperature and activate major bodily functions. The human body can easily absorb far-infrared heat because of its deep penetrating ability. Studies have shown that far infrared waves can actually penetrate up to 2-3 inches deep into muscular tissue and ligaments. When far infrared heat penetrates through the skin into muscular tissue and ligaments, it transforms from light energy into heat energy. The thermal effect within the deep layers of tissues cause blood vessels in capillaries to dilate which improves blood circulation and promotes healing and wellness. Picture before using Therasage products with far infrared heat. Yellow indicates poor blood circulation. After using Therasage products for 30 min. The orange color indicates better blood circulation. After using Therasage products for 60 min. The red color indicates improved blood circulation. Our bodies radiate far infrared energy through the skin at 3 to 50 microns, with most output at 9.4 microns.. Therasage products emit between 4-14 microns which matches so closely to the human body's radiant energy that our bodies take in close to 93% of the infrared waves that reach our skin. Therefore, FIR rays have the ability to penetrate deeply (up to 3) and permeate thoroughly into the skin. Far-infrared heat stimulates vasodilatation of peripheral blood vessels, bringing oxygen to joints and extremities, speeding the healing of sprains and strains, thus relieving pain and reducing the time it takes the human body to recover from an injury. Far Infrared heat reduces stress by loosening the muscles and relaxing the body. The gentle warmth gives you an overall massaging effect, soothing jagged nerves and knotted muscles. You'll feel rejuvenated and renewed, restored in both body and mind. Far-infrared heat is absorbed by cells, causing a physical phenomenon called "resonance". Thus the cellular activities are instantly invigorated, resulting in a better blood circulation and an overall improved metabolism. The increased blood circulation, but not blood pressure, stimulates the tiny blood vessels in the skin to expand accommodating the increased blood flow. When toxins are present, blood circulation is blocked and cellular energy is impaired. The body's immune system is inhibited, which makes it difficult to fight disease. When far-infrared heat is applied, the large water molecules in our bodies that contain toxic gases like sulphur dioxide, carbon dioxide, lead, mercury and chlorine vibrate and are broken down. The encapsulated toxic materials and gases are then purged from the body through the skin, during perspiration. The infrared heat raises your inner body temperature, inducing an “artificial fever”. Fever is the body's natural mechanism to strengthen and accelerate the immune response, as seen in the case of infection. This enhanced immune system, combined with improved elimination of toxins and wastes, increases your overall health and resistance to disease. Far Infrared Heat increases blood circulation and the lymphatic flow stimulating the sweat glands, releasing built-up toxins and waste. Daily sweating can help detoxify the body as it rids itself of an accumulation of potentially carcinogenic heavy metals (lead, mercury, nickel, cadmium) as well as alcohol, nicotine, sodium, sulfuric acid and cholesterol.